The Kovarik family started like all other Czechoslovakian immigrants who passed through Ellis Island – with the clothes on their backs, a dream and a strong work ethic. They settled in Binghamton’s 1st Ward to be close to other Slovak people as they assimilated into this new life. Frank Kovarik and his brother Fred enlisted in the Army and served during WWI, Frank having suffered from mustard gas poisoning. In 1922, the brothers decided to open a store they felt would benefit the area and opened Kovarik’s hardware store in the 3500sf building on Clinton St that is now occupied by the Mad Hatter Antiques. It was at this location that Kovarik’s went through various changes that helped solidify their presence in this area. 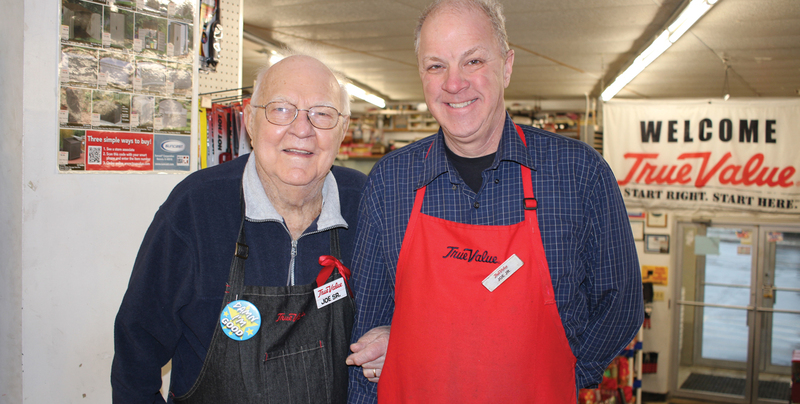 Frank’s sons Frank Jr and Joseph took over the store, they became affiliated with Tru Value and their store in 1966 relocated to 276 Clinton St as they needed the 10,500sf facility to better meet the needs of their customers. The leadership and the family members involved with the store changed but the same guiding principles from which the Kovariks had built the business have always remained constant “be a part of the community”. For the third generation of Kovariks being a part of the community means more then ensuring they have the lowest prices or a wide selection of products or even a staff complete with master electricians, plumbers and mechanics. Being a part of the community means living in the community, working in the community and supporting the community. Today the store is run by 95 year old Joe and his beautiful wife Virginia, their daughter Debbie, their son Joe Jr who was handed the Presidency, and Joe Jr’s wife Cindy. Everyone walking through their door knows their name and a story or two to share. They know them as their neighbors and their friends. And they have supported religious and equality organizations, the veteran groups, scouts, libraries, retirement homes, golf tournaments and a wide array of not-for-profit charities. They have always been there for the people of this community. In fact during the floods when all others couldn’t get around, it was the Kovarik family that risked it all to get to a warehouse full of generators and transported it back to help those in need. As Joe Jr said “We are community and we are dedicated to take care of the people in this community”. After nearly 100 years in business Joe’s grandfather Frank has to be proud of his family and the principles he instilled in them.